A look at old jets, turboprops and prop driven aircraft. The checklists, manuals, systems, and equipment...everything that made them fly . Pan Am’s DC-6’s utilized equipment typical of most airline practices, the differences varied on a small scale between airlines. 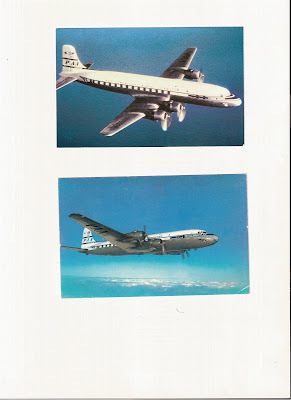 The Pan Am DC-6 carries duplicate V.H.F. communications sets giving it at least 50 different channels, HF R/T receiver and transmitter, A Loran Receiver two M.F. receivers with ADF, loops and cockpit indicators, two V.O.R. receivers with cockpit indicators, duplicated I.L.S., equipment, a Sperry zero reader, Sperry A 12 auto pilot and radio altimeter. The Loran receiver, the V.O.R. receivers and the I.L.S. equipment are used principally in conjunction with the related ground installations. The M.F. receivers, on the other hand, are approximately equivalent to normal medium frequency receivers and can be used for a variety of purposes. With out the loop they can pick up ordinary radio broadcasts, special meteorological information transmitted by various agencies. Actually the automatic loops tied to each receiver are used to obtain a bearing, relative to the aircrafts fore and aft axis, of the station transmitting. The normally accepted radio range is an MF aid picked up via the M.F. receivers, which take the form of the aural signals (Morse As and Ns) transmitted in four lobes so arraigned that at the intersection of the various lobes, the As and Ns merge to give a continuous tone in the pilots headphones. NOTE(This is your standard LF freq. radio range, such as the airways utilized in the U.S. and Europe during this time period.) The signal areas on the airways form a track guide in certain directions to indicate the exact position of the airway. EVER WONDER HOW TO FLY THE OLD LF AIRWAYS? Where ranges are located with the signal tracks following the airway, an aircraft will fly outbound along a certain leg until it reaches a point where it meets the inbound leg of another range. In order to show when the intersection is reached a beacon known as a FAN MARKER is placed there. When passing the Fan Marker which usually transmits on 75 mc the signal is picked up by and independent marker beacon receiver in the aircraft and in turn causes a light to be turned on in the cockpit. When this occurs it tells the pilot to tune the next radio range frequency and follow the new track. All along these airways there are reporting points, some voluntary but most of them are compulsory reporting points. Here the pilot will report his POR (position over report). In early 50’s radio ranges were the main ATC method for flying on the airways. By 1955 almost all the airways had changed over to the V.O.R. which there was complete coverage. In this early stage the actual V.O.R. transmitter was not necessarily placed on the airway, but may have been off to one side of the original airway. To help flying via the V.O.R. a system of VICTOR AIRWAYS was set up. This simplified the method of navigation by the aircraft being able to fly outbound along a V.O.R. radial until it reaches a point where the radial intersects a given radial from another station, the receiver is then tuned to the next station. V.O.R. (VHF Omni Range) consist of a station transmitting in the V.H.F. band with a continuous series of signals in every direction. This causes a needle on an instrument dial to indicate the bearing of the station. Our modern day airway flying procedures. We don’t need to go over that. It more import to understand the methods of the early system. The type of system described in the above paragraphs give position fixes by providing information on bearing and distances from a given point. For over water flight the system used was of the hyperbolic, or the (Area Coverage). These systems transmit a hyperbolic lattice wave pattern which can be picked up in aircraft by use of special receivers, from which the recorded signal can then be interpreted with the aid of special charts to give the actual position. Most of these receivers worked in the HF band using a group of stations called “Master” and “Slave” patterns. One of the first navigation systems was used during WW2 called “GEE”, it had a range of about 300 miles. The problem was the accuracy was affected by ground and atmospheric signals. Actually the airlines never used the system, but was used by military bombers for bombing runs into Germany and France. Out of the GEE system grew one of the longest utilized navigation systems. LORAN, using master and slave stations on the L.F. band. LORAN was accurate for position fixes up to 2,000 miles. Accuracy was again affected by atmospheric and terrain conditions. Another system utilized by the airlines was CONSOL, which was originally a German military aid used during WW2. CONSOL could be picked up by the normal M./F. Receivers on the aircraft. CONSOL consisted of a long range electrically rotated beacon which transmits its call signal every minute, followed by a steady stone for 30 seconds which the pilot could use his A.D.F. receiver for a bearing. This was then followed by a series of dots and dashes which the navigator counts as they are received. By knowing his approximate bearing from the station and then finding the exact radial near this bearing on the consol chart where the combination of dots and dashes occur, he will find the bearing of the station. Loran and Consol, was utilized on overwater flights because of the longer range than V.O.R. or M.F. facilities. In the 50’s the Eastern Atlantic seaboard was covered by consol network. LORAN stations were located at Seville, Spain, Lugo Northern Spain, Quimper Britain, Bush Mills, Northern Ireland and Stavanger, Norway. A Pan Am DC-6 flying from New York’s Idlewild airport, (JFK) to Shannon, Ireland, will first use LORAN and then CONSOL as available. Naturally a constant position and track will be made by the navigator using the astro-navigation method, using sextant and tables. During the crossing the Clipper will report its position to the Atlantic control stations every hour via H.F. or wireless, mostly by the H.F. frequencies, Which by the way is still used on the North Atlantic run in this day an age, reports being sent to New York, London, Gander, Shannon Keflavik and Santa Maria. These stations are all in contact with one another so that all position reports by aircraft can be reported to the appropriate ATC or company. At this time Pan Am’s New York station watched all aircraft out to 30 deg. west, when the Pan Am London office took over. Pan Am’s standard procedure for its navigators was to use D.R., LORAN and Consol and the crews could also make use of the facilities offered by the ocean weather station ships. These ships are distributed over the North Atlantic. Each ship has a radar capability of about 90 miles. They also have V.H.F. for in range communications and direction finding, along with non directional M.F. beacons on which the aircraft can take a bearing with their A.D.F. Weather can be transmitted to the aircraft via the ships forecaster. The one point is the ships did drift and did not maintain their position with the accuracy of a land beacon. But many ocean stations helped many aircraft in need. 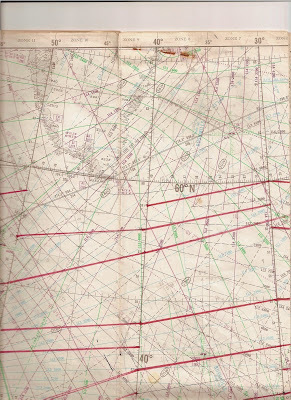 A special lattice system was printed on the navigation chart, from which the can tell the aircraft where she lies in relation to her position. 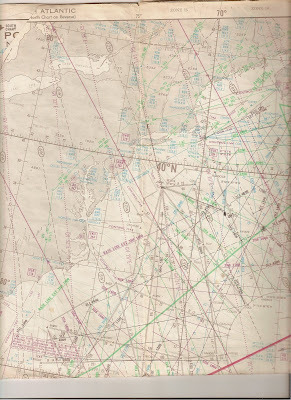 When the Pan Am Clipper left New York it was given permission by ATC to fly out through a particular control zone called ADIZ (Air Defense Identification Zone ) these zones surround most of the coast of the U.S. All flight s had to report at certain points during transition. After the ADIZ the flight was flying on its flight plan. On all Pan Am DC-6’s the practice was to carry a Captain and two first officers, (all pilots) one of whom will be a trained navigator. A flight engineer and a radio operator. The navigator used a chart 1; 5,000,000 scale Mercator conformal covering the whole distance from New York to London. The chart will show ADIZ zones and boundaries, LORAN lattices and CONSOL bearing roses, weather ship positions and most important latitude and longitude lines. The navigator will if possible, in view of weather conditions and load factors fly as direct a route as possible after leaving the U.S. ADIZ. Actually he will try and navigate directly to the south leg of the Shannon radio range located over the sea, it is known as South Shannon. From another point out in the Atlantic a branch is drawn direct to the Shannon Airport. Either of these tracks can be followed by the navigator. If the Captain decides to fly to South Shannon, he must then decide whether to continue or turn north to Shannon. He must have fuel remaining for two hours holding there, or if he decides he can continue non stop to London and declares it as his alternate, he needs fuel for only one hours holding. Usually because of fuel he has to choose Shannon, and flies there, using the southern range leg and beacons. The time from Shannon or his final leg to London will be a short one and this time the flight will be entirely within the airway control. What I found out that is quite interesting in this time period was, once the flight was past the ADIZ the navigator is free to plot his course more or less where he finds the best conditions and it can make use of pressure pattern navigation. This means that for a given route the shortest way to a destination may not necessarily be the quickest one, because of wind conditions. An advantage may made by the navigator by following a line of constant barometric pressure, thus taking advantage of the favorable wind patterns on one or the other side of the track. This is why the navigator had to have a good sense of meteorology and wind patterns to be able to utilize the weather maps to his advantage. A lot of time there was a big discrepancy between forecasted weather maps and actual conditions, but could be checked with a radio altimeter against the standard pressure altimeter. All Pan Am DC-6’s carried a radio altimeter. I was a USAF Navigator w/SAC, ADC and Vietnam combat. 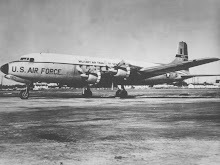 I am working on an event of 23 Mar 1951 in which a USAF C-124 went down in the Atlantic about 750 miles off Ireland. All 53 USAF men ditched safely and were counted in the sea by a B-29 from their squadron. The Air Cap didn't continue and the Navy showed up 19 hrs later. All men including their rafts had disappeared including a Brigadier who was to be the new SAC commander in England. Name was Cullen. There was probably a nuke on board from Loring AFB ME which had armed B-36's rotating to England. Trumen knew how to pull Uncle Joe's chain. I had a close relative on board. To this day it all remains highly classified. From various NSA sources I now can prove these men were taken by at least 2 Red Banner Soviet Baltic fleet subs. (They were captured German U-9's.) My latest research strongly points to their being taken for interrogation to Kaliningrad, Russia. I am trying to plot the sub movements from very very limited information and need to know how far out the Ireland and England ADIZ's of 1951 extended. If you know the ADIZ entry points to Shannon or further south toward London it would help me get a picture of the subs patrol area as they would probably have stayed outside these but near them. Russian Naval Doctrine of the day called for Wolf pack tactics and they heard the C-124's Mayday. The southwest range to Shannon is 450 miles to 750 miles thus suggesting a great circle heading of about 087 degrees on the approach to England. I need the Adiz distances on the south of Ireland to refine the track. My interests are Aviation, military history, Early Baseball and anthracite coal mining. My interest in military history deals with what the common soldier, sailor, marine and airman experienced during peace time or war.I enjoy old aircraft their systems, equipment and operations. I have published four books two on military history. "Pennsylvanian Voices of the Great War".McFarland Press and "The History of Company C 50th Pennsylvania Veteran Volunteer Infantry, from the camp, battlefield and the prison pen, " The History Press. My coal mining books include, "Early Coal Mining in the Anthracite Region," Arcadia Press and "Death in the Mines", The History Press. I served for four years in the USAF as an aircraft mechanic working on many different types of aircraft. I served for 13 months in Vietnam while working and flying on the C7A Caribou. I also worked as an Air Traffic Controller in the PANG. I started my work career after the military as an aircraft mechanic for the US Gov't working on Ch-47, OH-6, OH-58 U-8 and U8-F aircraft. . THe Best aircraft I Ever worked On.